Light is a major cue for our body. Exposure to sunlight resets our biological clocks and keeps our internal cycles aligned with day and night. Conversely, evidence suggests that artificial light sources have a hand in disrupting our sleep routines and derailing our circadian rhythms. But how does our body detect and respond to light in the first place? Research says our eyes hold an important answer. Deep within our eyes, scientists have found special pigments that send chemical signals when exposed to light. One such pigment helps trigger our sleep/wake cycles, and it’s called melanopsin. 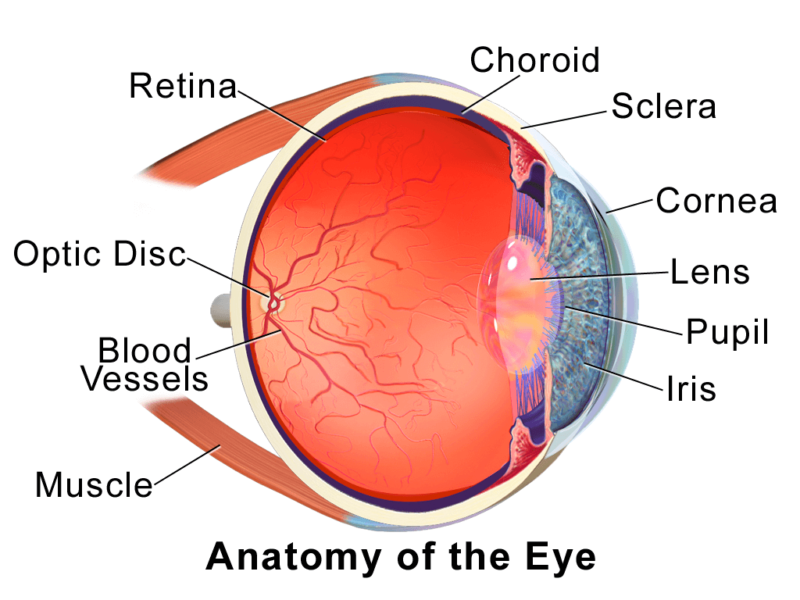 Before anything else, let’s look at the basic structures responsible for how our eyes process light. To understand how our eyes make sense of light, we need to look at the retina. If our eye is a camera, then the retina is the film. It packs layer upon layer of neurons and photoreceptor cells. These photoreceptor cells, called rods and cones, contain sensitive pigment proteins, which undergo a chemical reaction when they absorb light. These proteins are called rhodopsin and photopsin, and they’re responsible for translating light into biochemical signals that our neurons can transmit. That’s how our eyes can then pass the information along to the brain. Over the years, though, scientists have found that the retina does more than translate light into images. That is, image-forming vision turns out to be just one of our eyes’ many functions. Remember those neurons packed into our retinas? 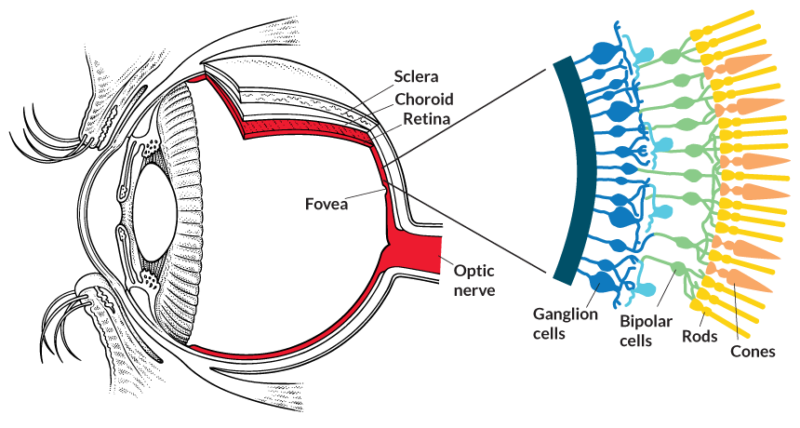 They come in different types, each with a specific function: connecting the photoreceptor cells to the main optic nerve, for example, or carrying sensory information as part of the optic nerve itself. One of those neuron types goes by the name ganglion cell, and research has found that they don’t just transmit information from photoreceptors—they react to light themselves. Clusters of these special neurons reside in the inner retina. Instead of relying on the photoreceptor chain, these retinal ganglion cells are intrinsically photosensitive—hence their nickname, ipRGCs. Like the photoreceptor cells, they also carry a light-sensitive pigment called melanopsin. Unlike those cells, though, these ganglion cells don’t contribute to the translation of light into visual images for our brain. In fact, scientists have found that ipRGCs aren’t as quick to switch on or off compared to photoreceptors when exposed to light. While the rhodopsin and photopsin proteins occur in dense clusters in the retina, melanopsin is scattered across the ganglion cells. This means that ipRGCs have a higher activation threshold and a longer response time: their reactions are gradual, unlike the instantaneous light-to-image translations of photoreceptor cells. That gradual response time is important because ipRGCs speak directly to our brain’s suprachiasmatic nucleus or SCN, also known as our body’s “master clock.” The melanopsin system’s slower response mechanism is perfect for gathering information from long-duration exposure to light—like the varying levels we experience over the course of our day. The melanopsin system’s reach can also extend beyond the brain itself, thanks to the SCN. When the SCN receives information from the eyes’ melanopsin system, the SCN fires up pathways in our sympathetic nervous system (the chain of neural connections that control our body’s autonomous processes, like breathing and heartbeat). That pathway leads to the pineal gland, which secretes melatonin, a hormone that travels through our body and regulates our wakefulness. The same sympathetic pathway also taps into sections of the spinal cord and related brain structures, which regulate heart rate, blood pressure, body temperature, and even hormones like cortisol, which influence our stress response. Research has recorded consistent decreases in core body temperature and spikes in adrenal gland activity when subjects are exposed to light; this connection between the melanopsin system, the SCN, and our body’s autonomic nervous structures explains why. Melanopsin doesn’t just signal our brain to feel sleepy; it also kicks off the numerous shifts in overall body state that constitute sleep or waking. The SCN isn’t the only part of the brain that receives information from these melanopsin-carrying neurons, though. Researchers have also found strong links with brain regions like the ventrolateral preoptic nucleus (VLPO), which helps control our sleep/wake cycles, and the olivary pretectal nucleus (OPN), which helps control our pupils’ regulation of the amount of light that enters our eyes. Other areas of the brain like the dorsal raphae nucleus and locus coerulus, which influence mood and cognition, also get input from the melanopsin system, suggesting a direct relationship between light exposure, cognitive functions, and even mental health. Recent experiments have found that all these brain regions—the SCN, the VLPO, and so on—respond to blue light, in particular. That’s no coincidence. Melanopsin reacts most to wavelengths of light in the 450-500nm range: blue and cyan light. If you’ve ever wondered why our alertness, emotional responses, and our sleeping patterns can be affected so drastically by a specific type of light, you can thank our eyes and their melanopsin-carrying ipRGCs. The melanopsin system forms the core of what scientists call non-image forming (NIF) vision. We’ve long known that our eyes are the only source of light information for our body’s master clock, but we only recently discovered that image-based sight wasn’t all there was to that information. The distinction between image-forming (IF) and non-image forming (NIF) vision helps explain why we seem to be more reactive to some types of light than others, as well as how people with impaired sight (i.e., because of lack or loss of their photoreceptors) can still have excellent perception of day-and-night cycles or shifting phases of light over the course of the day. Researchers are still investigating the extent of melanopsin’s role in regulating our biological rhythms and internal processes. Still, what we have found out sheds important light (pun intended!) on the key switches for some of our body’s most important systems, including our circadian clocks. If you’ve been wondering how light came to play such a big role in our behavioral patterns and overall health, look no further than the light-sensitive pigment that’s so crucial to many pathways in our mind and body: melanopsin.